We hope to show you, over a period of time, some of the fine artistic work of Jack Chalker, who has kindly given us permission to use his work on our site and in our exhibitions. We know his work can only enhance our web pages and bring to you a glimpse of the POWs in captivity. On becoming a P.O.W., he hid his small supply of colours in a scrap of an old gas cape with a few brushes and drawing nibs in a false bottom in his haversack. In turn the paintings and drawings he produced were concealed in a hidden section of bamboo, the end being sealed with a wooden stopper. During his years of captivity many of his precious sketches were destroyed by cockroaches and termites who could eat through anything, but fortunately many of his drawings and paintings survived to bear testament to the conditions that the P.O.W. 's were forced to endure. 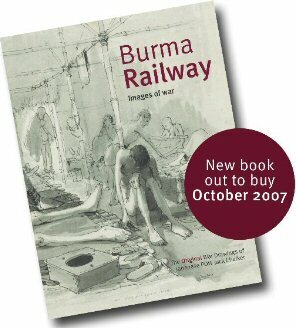 Jack's work and his own story are brilliantly portrayed in his book "The Burma Railway Artist"
This book is recommended to anyone who wants to know more about the life of a prisoner working on the railway. Both the text (not without a touch humour) coupled with his sketches and a few delicate water colours, complete an excellent impression of "life on the railway". Incidentally, a gallery has recently been opened in Thailand, at a place called Home Phu Toey, near the Hellfire Pass in which the work of Jack Chalker is on display. Our group of COFEPOW members visited this gallery during a tour of the Far East in April 2001 - it was well worth the visit.